"To Latinos everywhere, these are not only our bread but usually our utensil at mealtime as well! Some like big and thin, some like them small and fat, depending on the region of the country you're from and the way your grandmother made them!" Mix together the flour, baking powder, and salt in large bowl. Cut in shortening to resemble cornmeal. Add water slowly, mixing with your hands to make a soft dough. You may not need all the water. Knead a few minutes on floured surface until smooth and elastic. Lubricate top with oil, put back in bowl and let rest, covered for 10 minutes. Divide into small balls the size of golf balls and proceed to roll out into size and thickness you prefer. Cook on top of stove over medium heat using a cast iron grill or heavy skillet until top is slightly bubbly then turning on opposite side for a minute or two. Keep stacked and warm inside a clean dish towel. 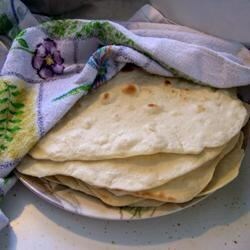 See how easy it is to make your own homemade flour tortillas. I found that it takes more time than it is worth to make tortillas.They come out dry and stiffer than the bought ones . Unless your having a lot of help, it isn't worth it. This is the first tortilla recipe I've found that makes tasty, pliable tortillas. They keep well for several days when sealed in a ziplock bag. Delicious and fast to make! I have tried making tortillas in the past without much success. This was the easiest dough to roll out! It was like playdough. I will be making these again.